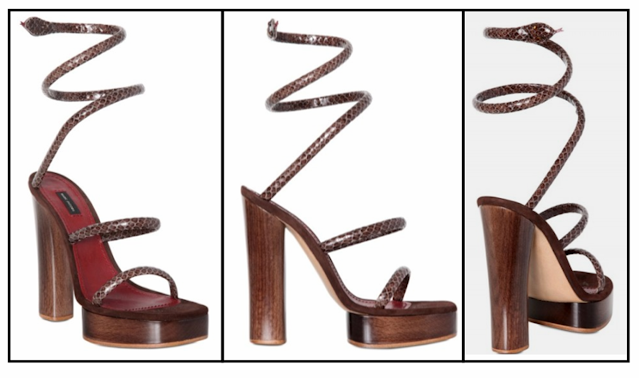 Today's So Shoe Me is the Python Print Sandals by Marc Jacobs, $878, available at LUISAVIAROMA. A sleek wooden sandal gets a subtle exotic makeover with python printed leather straps and a snake wrapping around at the ankle. The monochromatic color scheme makes this sandal a sophisticated and wearable piece for the spring and summer and still makes a statement with its fun and edgy ankle wrapping snake detail. These Marc Jacobs beauties give off a confident style and even would pair well with a flowing "Greek Goddess" style gown. I would love to see these sandals paired with a minimalist color scheme and modern clean-lined shapes. Either a simple black or white maxi dress with a high slit (to show off the shoes of course) or a midi or mini length body con dress would be the perfect way to simply show off these signature sandals. So Shoe Me a pair of seductive serpent heels that bring a modern edge to the more simplistic pieces in my closet.